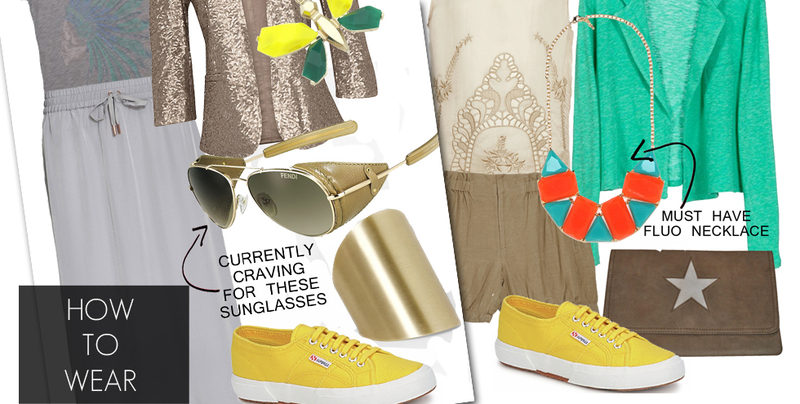 A few weeks ago I did a blogpost on how I was thinking of buying myself some Superga sneakers. Of course it didn't take long before I ordered myself a pair. With summer on my mind I went for bright yellow. When I showed a first preview on my new pair of Superga sneakers on Twitter and Facebook last week I received a lot of enthousiastic comments. However, some of you immediately answered they wouldn't know how to wear them. Apparently the bright colour and the sporty style makes it difficult to imagine how these sneakers would look in an outfit. So I decided to do some online hunting and show you my two favorite combo's, one for a stylish summer afternoon and one for fashionable Friday drinks. Love to hear your thoughts and feel free to share how you would style these Superga sneakers. Those Fendi glasses are to DIE for!